The Department of Peace Operations (DPO) is dedicated to assisting the Member States and the Secretary-General in their efforts to maintain international peace and security. DPO provides political and executive direction to UN peacekeeping operations around the world and maintains contact with the Security Council, troop and financial contributors, and parties to the conflict in the implementation of Security Council mandates. Peacekeeping is political and its ultimate success depends on active and sustainable political processes or the real prospect of a peace process. The Department works to integrate the efforts of UN, governmental and non-governmental entities in the context of peacekeeping operations. DPO also provides guidance and support on military, police, mine action and other relevant issues to other UN political and peacebuilding missions. DPO traces its roots to 1948 with the creation of the first UN peacekeeping operations: UN Truce Supervision Organization (UNTSO) and UN Military Observer Group in India and Pakistan (UNMOGIP). Up to the late 1980s, peacekeeping operations were operated through the UN Office of Special Political Affairs. The official DPO was formally created in 1992 as the Department of Peacekeeping Operations (DPKO) when Boutros Boutros-Ghali took office as Secretary-General of the United Nations. The Under-Secretary-General for Peace Operations is Mr. Jean-Pierre Lacroix. The Office of Rule of Law and Security Institutions (OROLSI) supports rule of law components in United Nations peace operations and special political missions as they work with national authorities to protect civilians, extend State authority, re-establish law and order and stabilize conflict and post-conflict situations. OROLSI provides expertise and integrated guidance in the key areas of police, justice, corrections, security sector reform, mine action and the reintegration of ex-combatants into civilian life. The Policy, Evaluation and Training Division (DPET) is mandated to develop and disseminate the policy and doctrine guiding the work of peacekeeping. In addition, the division has the responsibility to evaluate, at the request of the heads of the departments, how those policies are being applied, gather lessons learned and best practices, and use that information to guide the development, coordination and delivery of standardized training, so as to complete the learning cycle. DPET is also responsible for developing and maintaining strategic cooperation with various UN and external partners. 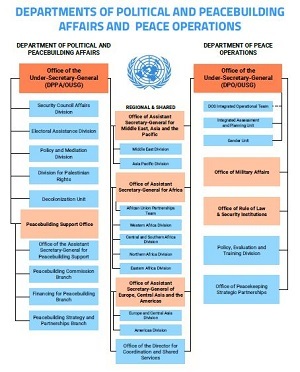 In addition, DPO shares with the Department of Political and Peacebuilding Affairs (DPPA) eight regional divisions that are managed by three Assistant Secretaries-Generals that cover the Americas, Europe, Africa, Asia and the Pacific.